It was a hot summer’s afternoon in the month of May. The sun was beating down pretty hard as it usually does in this season. The Nirvana Adventures paragliding crew along with the pilots and paragliding students had left Native Place an hour earlier and were already at the flying site getting geared up for another glorious flying day. Students who were at day one and day two of the course were learning how to kite the glider on the ground with the instructors running along side them. And the pilots were making their way up to the takeoff 80 meters above. Sanjay was waiting at Native place for a group of 70 young spectators between the ages of 7 to 15 from St Catherine’s Home and orphanage in Mumbai who were scheduled to come over for a visual paragliding treat. 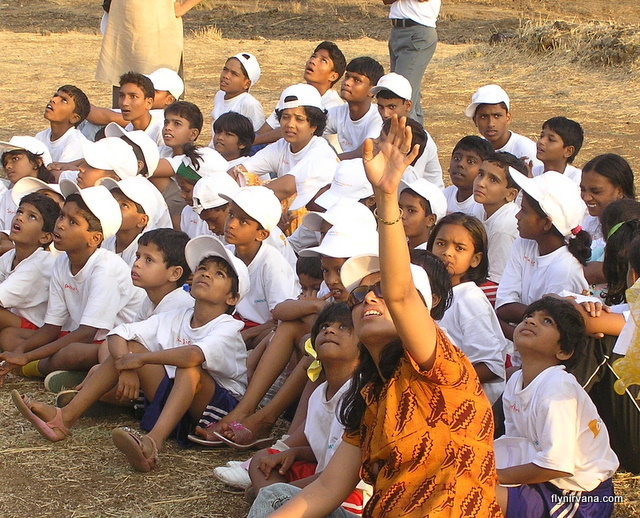 Siemens had arranged a camp for the children at Lonavala as part of their CSR initiative and we at Nirvana Adventures happily agreed to give the children a peek into the world of free flight. 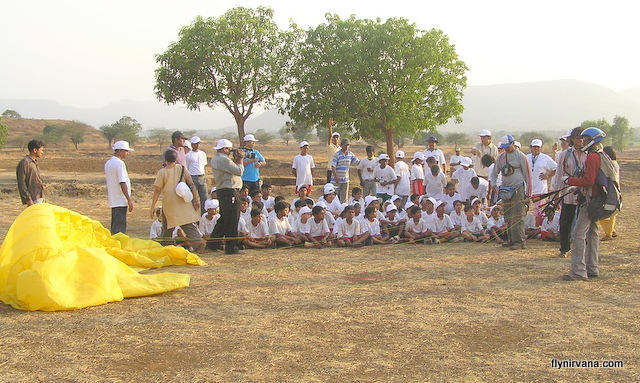 Sanjay accompanied the children to the flying site – 70 excited children full of energy and enthusiasm. As they walked together to the site they spotted the colorful gliders gracefully gliding about in the sky along the hillsides. This made them rush through the fields at top speed to reach the base of the hills and get a closer look. They were all eager to fly and were disappointed to hear that this was not a part of the plan. They all urged Sanjay to give them rides and he had the hard task of explaining to them that it was not possible to fly so many people in one session and it would be impossible to choose one or two from amongst so many. 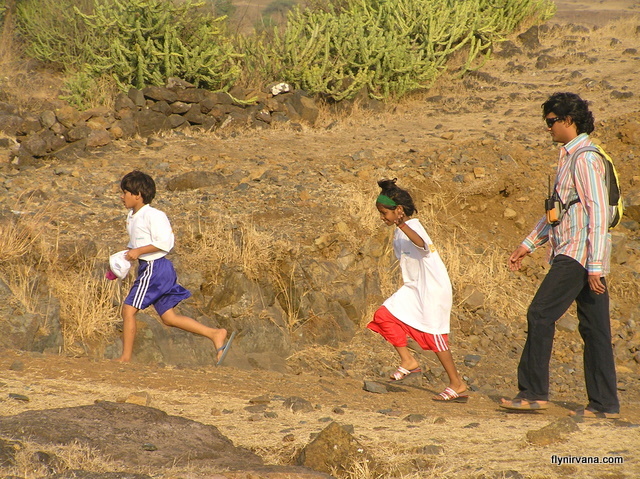 One little girl tried to convince Sanjay saying “there are only 12 girls in the group, give the girls a chance uncle”. Unfortunately this too was not possible and we simply had to leave it for another day. A promise Nirvana Adventures will surely keep. CSR is not new for Nirvana Adventures in fact it was interesting to see the youngest 3 members of our crew, our greatest CSR initiative so far, share the secrets of kiting the glider with these 70 kids from the city. Ravi, Bandya and Sandeep are local village children who have been around at the Shelar site since the time we started paragliding here 10 years ago. . Ravi was employed by Nirvana Adventures in October 2003 on a full time basis after he finished school and is today a competent tandem pilot, and a capable instructor. Bandya and Sandeep have been working with us since February 2007, although Sandeep works part time now so that he can continue to attend college. No doubt they too will find their places in the sky pretty soon. Now that’s the kind of CSR that can make any company proud.